Yet another year has passed by and we are already in the last quarter of 2014. And this also means that we will have another Call of Duty awaiting us. And we can rejoice that this mass produced product is sporting a new coat of paint and plenty of extra gadgets to spice up the norm this time. It was made by a completely different studio, packing a brand new engine, and offering a futuristic timeline. So this raises the question, is this Call of Duty, or an experimental new design packed under a brand that can move boxes? Keep reading to find out what I thought of the new game in the series featuring Kevin Spacey! 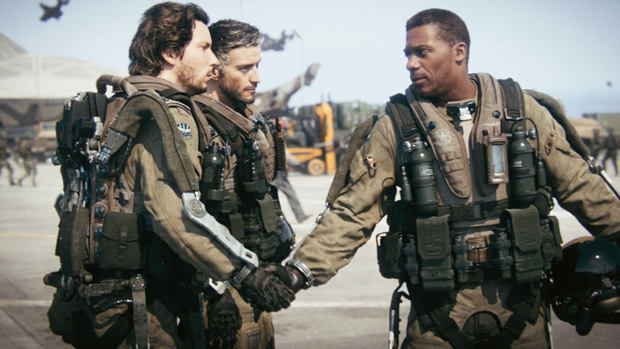 No more Captain Price or Captain Soap, for the modern warfare fans I honestly don’t think we will ever see these two heroes again. 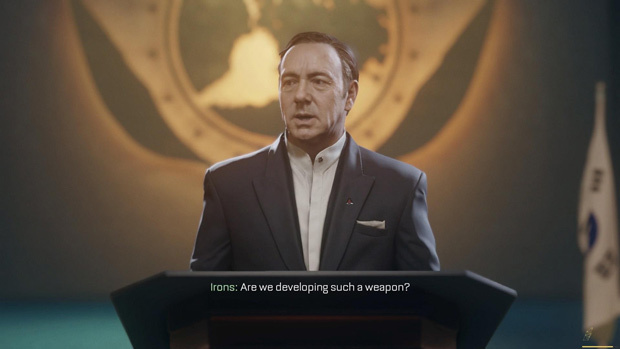 Instead Activision went big by creating a character based off Kevin Spacey, infamous for his recent roll in House of Cards. If you’re a fan of him there, you will immediately get into the groove of his Call of Duty persona. Combined with modern graphical feats, this is a living character that can truly get the player invested in the story. I have to admit something, and I consider myself endangered species for this. I love the single player stories in every Call of Duty and never want to miss one. Except for Call of Duty Ghosts, we don’t talk about that game; let’s just agree it never existed. 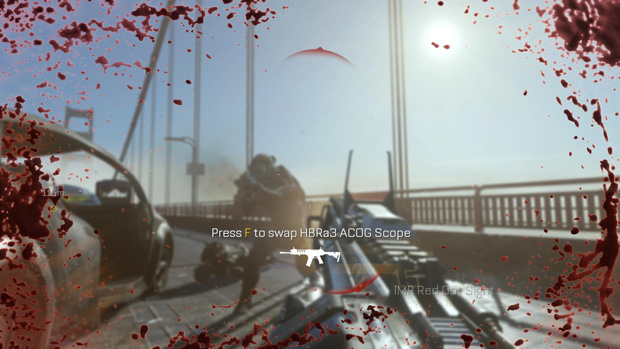 Unfortunately the last few games in the Call of Duty series only had a short single player, and the good old times of having more than two digits in total hours for a shooter is gone. But despite this, the single player usually feels like this sweet roller coaster ride. It might be short, but you’re always in for a heck of a ride. A Call of Duty game should build the atmosphere that you’re the star of a war movie, and the spotlight on the battle is all about you and your actions. Obviously there is not a lot I want to spoil about the Advanced War single player, but even if you’re a multiplayer junkie, you should give it a try. Trust me. It is one of those stories you will remember for the rest of your life with acting that puts the past games in the franchise to shame. Now let’s dive into the multiplayer and general gameplay. With the new introduction of the Exo-Suit, a suit that makes you able to jump higher, and boost yourself in various directions, the game play is comparable to Titanfall. 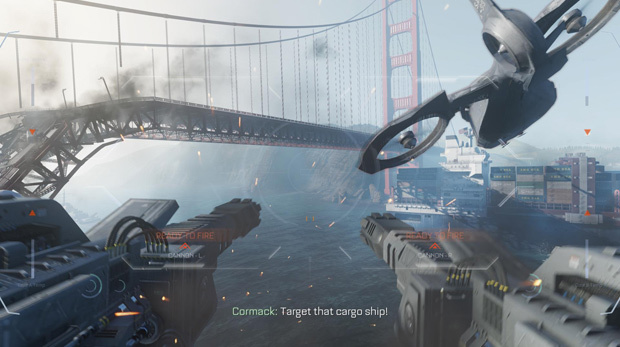 Funny enough Titanfall is made by the crew who were responsible for the first Call of Duty games at Infinity Ward. Beyond the iconic suit, you can expect futuristic weaponry as well, such as heat seeking grenades. All the crazy new changes combine to make for a believable setting, pulling you into a wild fast future. In the Multiplayer you will create your own persona, this persona starts at rank 1, and you can level it up to 50. After this they offer the prestige route, allowing the crazy people to go through the whole experience again up to 15 times. I honestly don’t see the joy in this as it took me long enough to unlock most of the weapons, so why would I willingly wipe my account? Anyway, it’s time to touch on the key differences between this game and its predecessors. The Exo-Suit gives this Call of Duty a completely new experience, the game is no longer only fought out on the ground, and bunny hopping got to a whole new level. No building is too low for the player, you can get almost everywhere now, and in some urban environments the battles are actually fought on the rooftops. 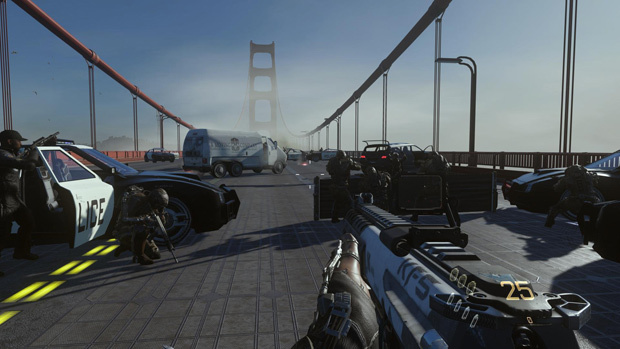 The weapons are a little different as well, and even though they can be compared to guns from this time, there are also lasers and grenade crossbows to shake up the typical weapon sets. And even though there is a lot of diversity among the weapons, I have to admit I think it is a bit strange with how they work. Right now people feel tougher than normal, and on average can take 3 bullets and keep coming at you. 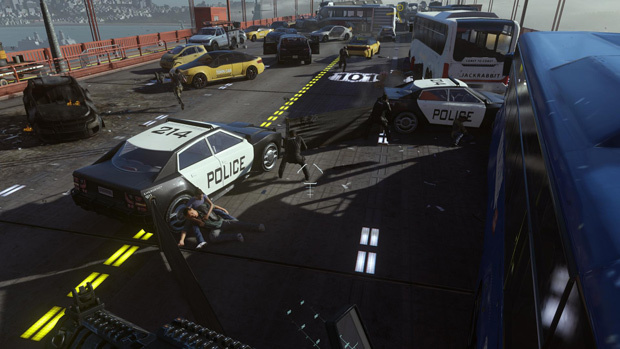 There’s a clear design decision here to improve gameplay by drawing out gun fights to feel more epic. But that design gets disconnected once you upgrade to the more advanced weapons like lasers that kill fast, efficiently, and without a need to reload. The tech gap is jarring. Nonetheless, the weapons are a lot of fun, and my friends did plenty of specific weapon only matches to avoid imbalances. A crossbow grenade battle can lead to an amazing drinking game for certain. Since you have your own Persona, and female characters are now present, the hunt for customizing clothing is on. Unlocking outfits to fit your style is endlessly addicting, and can lure you into hours of multiplayer action. Weapon skins are present as well, switching up the functionality of your preferred armament to help surprise practiced foes. Improved firing rate and increased damage are only the tip of the iceberg of what can be found. Serious clans in Call of Duty should enjoy the hunt to create the ultimate balanced teams with weapon skins that complement each other’s role in the team. Call of Duty is back! The last few games in this series were different, and most people didn’t enjoy the direction the game was heading in. But it is safe to say Activision brought back the recipe for success for the best-selling First Person Shooter of all time. But there is one thing I do have to criticize, and I’m not sure if it is me getting older, but the new pace of the game is insanely fast. It is absolutely chaotic in multiplayer with people coming at you from every angle and platform. With sliding, boosting, and running it feels like I need to be cranked up on coke to not miss a single thing. I wouldn’t mind a little slower pace, but at least it punishes the campers that sit in a corner waiting for free points. Yoozoo Games announced a new feature for their title, League of Angels II, where you build your own home.